Quitting smoking requires discipline and willpower, so if you've achieved it, you should feel great. You've significantly prolonged your life expectancy, and can expect higher energy levels, whiter teeth, healthier skin, fresher breath, and extra cash too. One side effect that bothers many women however, is weight gain. Around 80% of people put on weight after cutting out the cigarettes, with the average quitter putting on 11 pounds - that's 5 kg - in the first year. 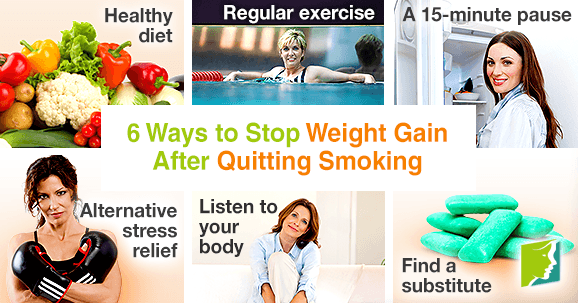 Don't panic though, read on instead and discover tips for keeping that extra weight off in the absence of cigarettes. Whilst it might sound obvious, it's worth mentioning that a healthy, balanced diet is vital for overall well-being. Eating a diet that's low in saturated fats, sugar, and salt but high in fruits, vegetables, and whole grains is also central to weight gain prevention. Nicotine, the addictive chemical in cigarettes, speeds up the metabolism, so when smokers quit they are likely to notice their metabolism slowing down. This alteration can increase the chance of weight gain. Partaking in regular exercise however, is an effective way of boosting metabolism, and burning fat. Try to partake in moderate-intensity aerobic exercise for 30 minutes, five times a week. Moderate intensity means slight breathlessness and increased warmth, but not exhaustion. Try brisk walking, cycling, or swimming to ward off those extra pounds. It takes the brain 15 minutes to register that the body is full after a meal. Before you reach for seconds wait 15 minutes to ensure you are still hungry, and not just overeating. Many ex-smokers replace cigarettes with comfort food in times of emotional stress. Although this practice is better for overall health, comfort eating can lead to weight gain. Try to find other healthy outlets for stress that will help you to maintain a healthy weight and body. You could try a yoga or kickboxing class, because exercise will release the feel-good chemical serotonin, which helps to relieve emotional stress. The restless, empty feeling of nicotine withdrawal can often be confused with hunger pangs which means overeating is more likely among recent quitters. Listen to your body; is it really hunger? Consider working with a dietitian to draw up a diet plan that helps you to identify when that emptiness is just nicotine craving and when its hunger. Having your food plotted out will ensure that your body is getting all the nutrients it needs. Many ex-smokers miss the oral satisfaction and ritual of smoking after giving up - particularly when around other smokers. This can lead to increased snaking as a “hand-to-mouth” substitute for cigarettes. Find a non-edible substitute for chips or sweets, like sugar-free gum or cinnamon sticks. This will provide a distraction for times when those around you are smoking. It may take a while to find a healthy routine that suits your lifestyle, so don't put pressure on yourself to drop weight gain quickly. Remember that the health risks of putting on a little weight are far less than those associated with cigarettes; you'd have to be 88 pounds - or 40 kg - above your recommended weight to equal the risk of heart disease that smoking poses. Focus on what you've achieved by quitting, and avoid undoing this hard work by re-starting smoking to trigger weight loss. What Causes Weigh Gain during Menopause? As menopausal weight gain starts becoming a problem, you may want to start exercising, but keep it consistent. Weight gain is common during perimenopause. Read on to discover how to achieve weight loss and relieve menopause symptoms. You've noticed a little weight gain here and there and you've set out to shed the postmenopause pounds. Read on for advice and information.